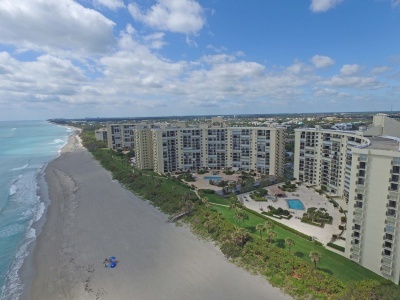 Ocean Trail is Jupiter's only oceanfront condo sitting directly on the sand overlooking the Jupiter Inlet. The gated community features 4 buildings each 14 stories plus the fifth building tucked in the corner of the property. There are five community pools , tennis courts and just a short walk to the Inlet . The condos are smaller 2 bedroom 1,200 sq. ft condos. They have galley kitchens with split bedroom plans. Some of the units are convertibles with no wall closing off the second bedroom. The corner condos have a small balcony off the master bedroom and a half balcony but much deeper than similar Ocean Trail condos. They make excellent rentals. The views from many of the Ocean Trail condos allow you to look down the beach or watch the boats go through the Jupiter Inlet. It's always a nice walk down to the Jupiter Inlet from your condo. Many of you don't realize but the first condos in Jupiter that everyone notices are the four oceanfront 14 story condos sitting on the beach. Built before Jupiter limited the height of condos here on the beach the massive buildings tower over everything else in Jupiter. The Ocean Trail condos feature exterior catwalks around the crescent shaped buildings. From the higher floors you can see the condos in Juno beach as well as the condos on Jupiter island and as far west as Jupiter farms. There are 10 condos per floor with the most desirable units being the corner units that face the ocean. The 500 building is the 5 story building in the SW corner of the property where only a few condos have slight ocean views. Each condo is a separate Association with its own rules regarding rentals. The complex is not pet friendly and trucks are not allowed. This is the only condo that cannot be shown on weekends. Like all the Jupiter beach condos you will find more to do than just enjoying the spectacular ocean views from your condo as well as days sitting out on the beach. The Jupiter inlet is just a short walk from Ocean Trail and is a great place to fish or just watch the boats coming in and out the inlet. Across the way you will see the beachfront community of Jupiter inlet colony, one of the more popular beachside communities here in Jupiter. Dubois Park is popular with the small estuary of shallow water off the intracoastal. The area has a lifeguard and is popular for young children because of the shallow water. Sit down and grab a chair and just enjoy the ocean breezes coming down the Jupiter inlet. It is a great place to sit and relax, read a book or just enjoy a sunny day. Search for Boca Raton oceanfront condos or Singer Island oceanfront condos as well on our other websites below. If a Jupiter beachfront Condo listing has caught your eye or you want more information about Jupiter, FL real estate, please don't hesitate to call 1-561-744-7025, or email via our handy contact form with any questions or to arrange a showing.